The Carnivorous Plant FAQ: Tell me about animals that live inside carnivorous plants! Q: Tell me about animals that live inside carnivorous plants! A: I am not an entomologist, so I am only going to help a little on this issue. It may actually surprise you, but there are many insects and other organisms that coexist quite happily with carnivorous plants! 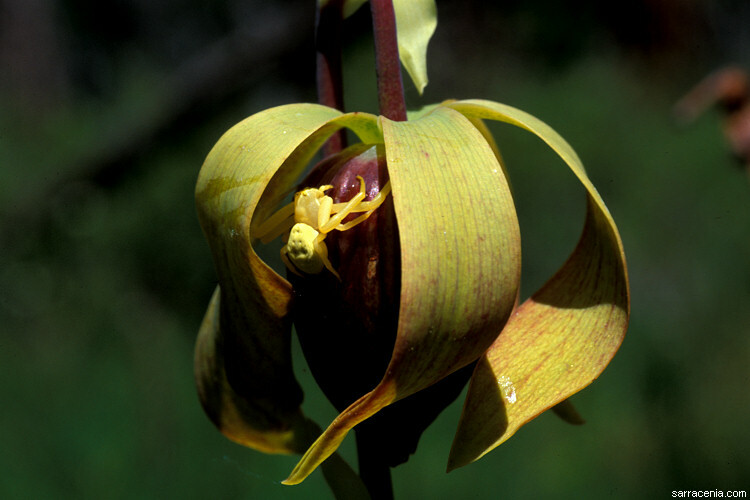 The yellow crab spider to the right is blending in quite nicely with the yellow sepals of Darlingtonia. It is happy in its carnivorous home. I have frequently seen green lynx spiders on Sarracenia. It often hides under the lid, and if frightened scurries inside the pitcher. While those predators use carnivorous places as foraging homes, there are some arthropods which depend upon carnivorous plants to even a greater extent. There are species of mosquito (Wyeomyia smithii) which live, as larvae, in the pitchers of Sarracenia pitcher plants! A kind of midge (Metriocnemus knabi) also lives in pitcher plants like Sarracenia purpurea. (I more to say about insects that live in Sarracenia elsewhere in the FAQ.) Darlingtonia has, in addition to a different species of midge (Metriocnemus edwardsii), a little critter sadly called a slime mite! 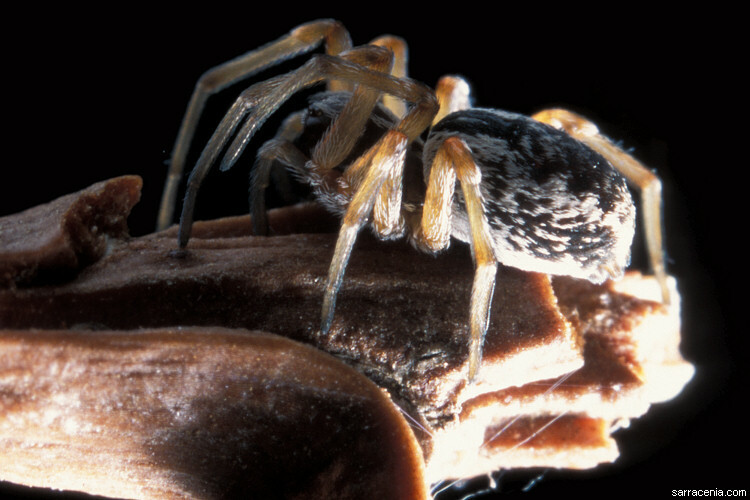 Its far more attractive Latin name is Sarraceniopus darlingtoniae, and you can learn more about it here. There are many cases of insects living in tropical pitcher plants (Nepenthes), too. Furthermore, some insects (including ants and spiders) actually dive into the Nepenthes pitchers and pull out captured prey. They steal from the poor, sad, defenseless carnivorous plant! 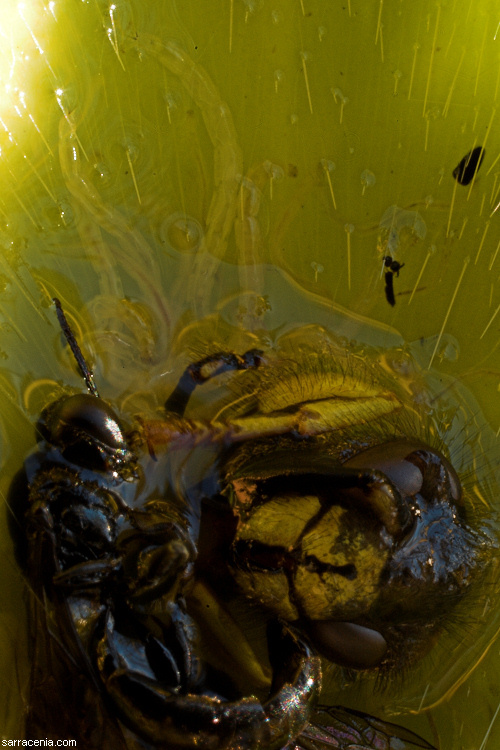 Meanwhile, other insects benefit from feasting upon pitcher plants. Moths such as the rare Papaipema and Exyra benefit from a diet of pitcher plants. I could go on for a while about this. For example, did you know that Nepenthes bicalcarata actually makes a home in its tendril so ants could live there, and the ant reciprocates by protecting the plant from damaging weevils? Or that spiders (specifically, the one in the photograph in the right) were long thought to be the pollinator of Darlingtonia? You probably didn't, which is why I am writing this FAQ and you aren't. Page citations: Clarke, C. 2001, 1997; Fashing, N.J. 2004; Merbach, M.A., et al. 2007; Rice, B.A. 2006a; Schnell, D.E. 2002a; personal observation.